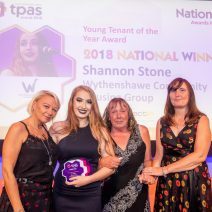 Wythenshawe Community Housing Group (WCHG) Youth Panel member Shannon Stone was crowned as the national winner in the prestigious ‘Young Tenant ‘of the year category at the 2018 Tenant Participation Advisory Service (TPAS) awards. After winning the Northern Regional final earlier in the year, Shannon was competing against young tenants from all over the UK at the event which took place on the 12th July in Warwickshire. WCHG Group Chief Executive Nigel Wilson said, “I’m delighted that Shannon won this award as it’s a fitting tribute to all the hard work she has put into supporting young people in Wythenshawe and around Manchester. She should be very proud at being recognised and setting a very high standard for other housing groups across the country’.